Since inception, Royalty Clearinghouse has acquired a significant number of interests in properties in Karnes County. Karnes County (754 sq miles) neighbors DeWitt County and produces gas from the Edwards Reef Trend in South Texas. 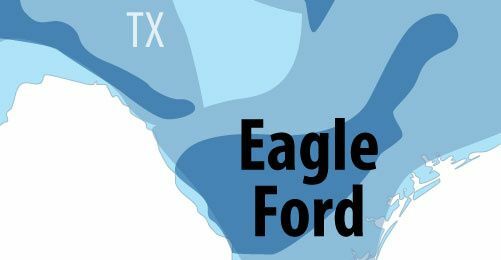 The region is not new to the oil & gas industry, but the Eagle Ford drilling boom brought development levels not seen before. The county is prospective for shale oil, shale gas, and the gas – condensate or liquids-rich window of the Eagle Ford Shale formation. With 14,975 people, Karnes County is the 140th most populated county in the state of Texas out of 254 counties. Karnes County is located in a prolific area of the Eagle Ford Shale, where its formation has a significant importance due to its capability of producing both oil and gas. Perhaps more oil than other shale plays. The county produces greater amounts of condensate, oil and wet gas. It contains a much higher carbonate shale percentage that makes it more brittle and easier for hydraulic fracturing. According to BP the Eagle Ford Shale liquids sweet spot is within the southern portion of Karnes and Gonzales County. The dry gas window also passes through the Southeast part of the county. Karnes county drilling is focused in the central portion for wet gas and condensate and the northwest for the shale oil window. The best shale oil wells have come on producing more than 30,000 bbls/month with an expected EUR (estimated ultimately recovery) as much as 400,000 boe. Our team of engineers have years of experience performing thorough economic evaluations of wells operated by some of the top oil and gas operators in Karnes County including Marathon Oil, EOG Resources, Encana Corporation, ConocoPhillips, Pioneer Natural Resources Co., and Statoil ASA. By sending your production statements, our engineers can quickly and thoroughly evaluate your interest in Karnes County. Karnes County is a part of a richly producing area of the Eagle Ford. Oil and Gas wells in Karnes County produce greater amounts of condensate, oil and wet gas due to its location, as well as modern fracking and horizontal drilling.